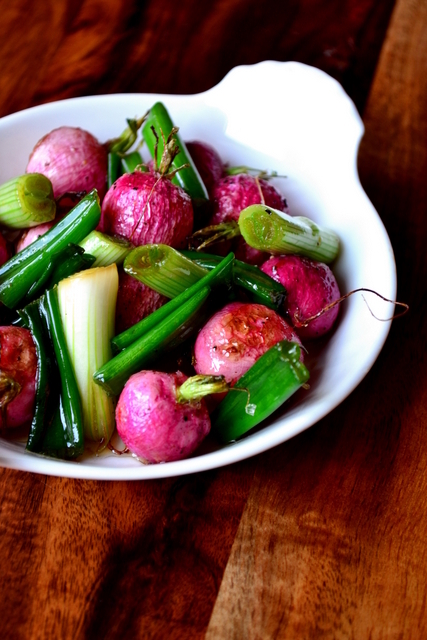 A simple fusion of great British produce and two iconic flavours of Asian cuisine, this recipe for Roasted Radish and Spring Onion Salad provides an inspiring use for two of Britain’s most loved early season ingredients. Usually eaten raw in light, leafy salads, roasting your radishes may seem novel, but doing so brings out a sweetness otherwise hidden by their usual peppery notes. This caramelised sweetness contrasts beautifully with the dark, salty quality of the soy sauce to create a unique and interesting salad you’ll not forget in a hurry. To be honest, roasting vegetables usually does the trick. It sweetens, mellows and improves flavour. 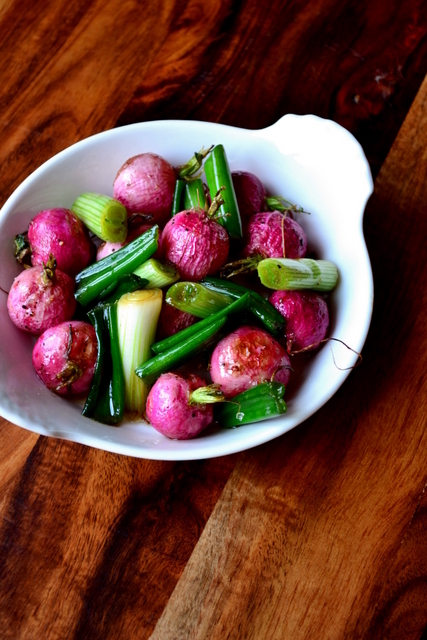 Though this recipe is undoubtedly simple, if you’re looking for an easy, healthy alternative to roast potatoes, radishes could be the answer. Simply roast with a little salted butter and serve. One of the great benefits of using fantastic, locally produced, seasonal produce is that even with the bare minimum of effort the results are astounding. Bought from my local grocer for 75p, the bunch of spring onions used in this recipe are crisp and fresh, while the radishes – also 75p – don’t suffer from a dried and damage centre like some of those you find at supermarkets. Trim and wash your radishes, leaving a little of the stalk for show. Roast at 180C for 20 minutes, until golden brown. On a high heat stir fry your spring onions and soy sauce for around 30 seconds. Transfer to a dish, add the cooked radishes, sprinkle with sesame oil and serve immediately. 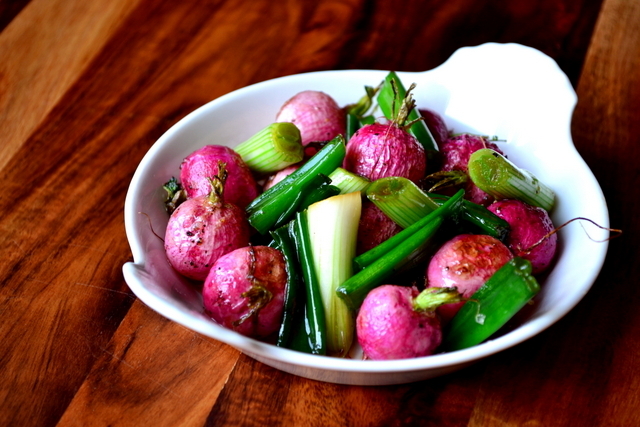 Cost: With both radishes and spring onions currently in season, this simple salad can be made for only a few pennies. Indeed, though this recipe makes use of some truly exceptional ingredients, it should set you back no more than £1.50. I can’t remember where I saw it, or where the idea cam from, but it works so, so well. Agreed–when I have them in abundance, I always wonder what to do with radishes aside from slicing into salads. Thanks so much! My pleasure! I hope you try it. 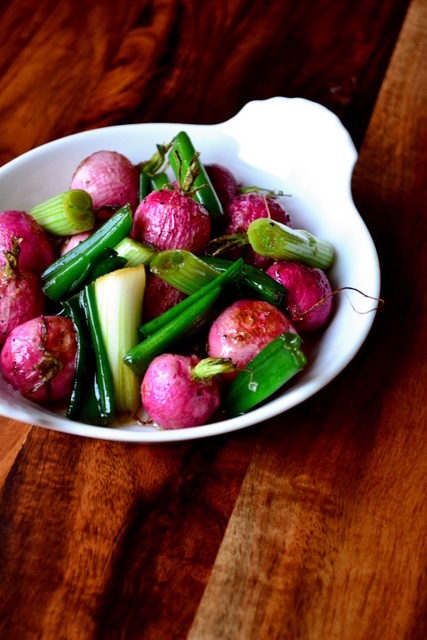 Funnily enough I chucked a handful of radishes into the roast veggies at the weekend and they were delicious. Like the idea of this little salad even more though. Fantastic – I’d never thought of doing it before. Works so well. That looks absolutely delicious! Will be trying this the next time radishes turn up in the veg box. Thanks for the inspiration! Thank you – roasting them really brings the pink colour out. Wow, that looks great and really tasty. There’s something really exciting about a recipe that only has a few ingredients as well. I’ll definitely be trying this one, maybe if any of my radishes survive I’ll even be able to use home grown and make it even cheaper! Thanks, Sally. I like to use as few ingredients as possible – it’s all about simple, delicious food. Thank you – me too. So crisp and crunch and sweet when roasted! Thanks – I was very pleased with the colour of the radishes. Love your blog. Some of your recipes look really good – I would love to follow your blog but I cannot seem to find a button for it…. I am pretty new to all this but at the same time maybe it is something you could improve so you will gather more noob followers like myself! Great idea, and would never have occured to me. I’ve had radishes raw, they taste great sprinkled with a little Indian chat masala. Or in a south indian sambar (veg & lentil stew). But never roasted. I have abunch of the french ones (they’re more oblong than round, and red and white on the outside) – but I’m going to try this out anyway. Great idea! I love the French ones, but obviously they wouldn’t be local – I have used them on here before though, very pretty!